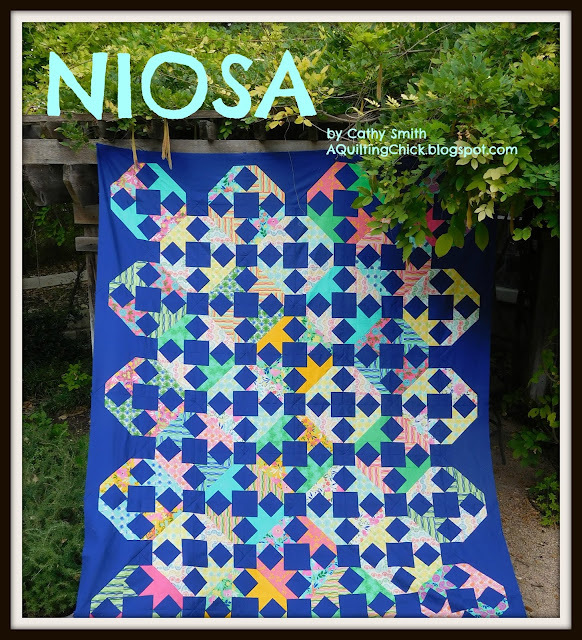 A Quilting Chick: NIOSA is here!! This quilt is made with a fabulous fabric line called Good Karma by Stephanie Ryan. The colors are so deep, so saturated, that it works perfectly for my NIOSA quilt. The pattern is on Moda in the full/queen size. If you want it in sizes crib/lap/twin/king, I have listed it in my Etsy store. And to celebrate my second quilt for Moda, we're doing a 20% discount on all of your purchases through the end of the month! Just use promo code NIOSA20. I hope y'all enjoy this one as much as I do! Alex has already been campaigning for it. Who is the perfect match for this quilt for you? If you make it, I'd love to see it! Please drop me an email sharing your pics. 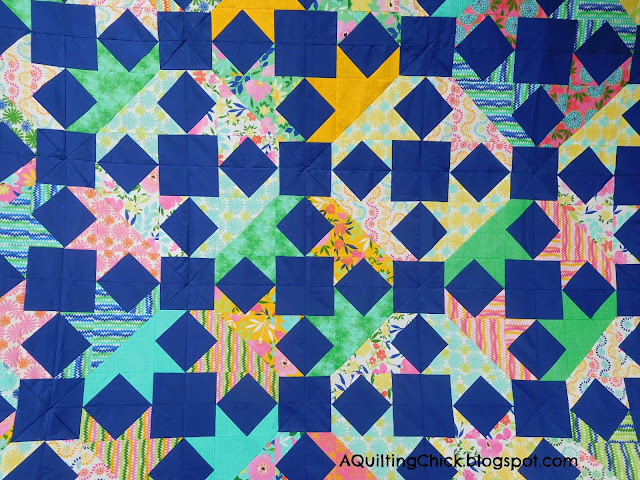 Linking up with Patchwork Times for Design Wall Monday, Main Crush Monday at Cooking Up Quilts, and Bits & Bobs for Design Board Monday. 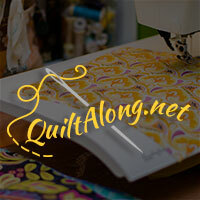 Fabric Tuesday at Quilt Story, Freemotion by the River for Linky Tuesday, and Blossom Heart Quilts for Sew Cute Tuesday. With Freshly Pieced for WIP Wednesday, NTT at My Quilt Infatuation, and Sew Fresh Quilts for Let's Bee Social. Congrats on your new pattern! Especially having it carried by Moda Bake Shop! It totally reminds me of San Antonio. I remember a visit to La Villita near the River Walk where my sister bought some cascarons (confetti eggs), and immediately broke them open, spilling bright confetti all around. This quilt reminds me of that moment! Terrific name for a quilt. The saturated colors are yummy. Fiesta in Santa Barbara in June includes a parade and vendor market and there are dozens of extra people standing on the sidewalk with crates of cascarones to sell. Congrats on your second quilt. Love all those brights with the blue! Gorgeous quilt. Congrats on your second pattern with Moda Bake Shop. I love, love, LOVE this quilt!!! But it really looks rectangular to me rather than 94x94, and I'm a bit perplexed.... Love the rich blue background you used. Congratulations!! I love how this quilt got it's name...and I can really see the 'fiesta'. I love how you walked through what could be a confusing tutorial with clear, concise instructions. The royal blue background is both perfect for the night, excuse me, niosa sky and is a beautiful, fresh design choice. Very nice! This is lovely! That blue background was an inspired choice!! Neat pattern. I really like the effect. It looks really good mom. I know I don't say this often, but I'm so proud of you and watching you follow your dreams as you grow more and more into your quilting. I'm proud to call you my mom. I love you! Congratulations too. thanks for visiting my little blog - I guess we both like sawtooth stars. Congratulations! Wonderful quilt. After not seeing any split stars for years, now they are popping up, and this darker blue background all the way around really gives them a different look. Lovely, lovely quilt. It’s a really bold choice to use such a vibrant blue as the background, but it so totally works! Congrats on your pattern... it's lovely! Congratulations on your pattern! The blue really is so striking, and allows the prints to show off their own beauty. Great job! I think it's super exciting to be featured in the Mode Bakeshop. :) Thanks for linking up to MCM! really beautiful pattern, and I love the blue background! Wonderful quilt Cathy! I love the background you picked! 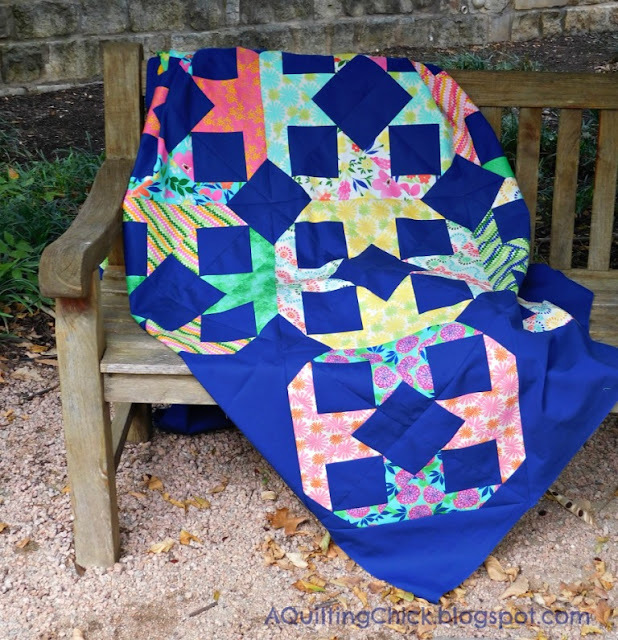 We featured your quilt over on the FWFS blog! Thank you for stopping by and linking up! Beautiful quilt Cathy and what a neat pattern! Congratulations Cathy! It is a gorgeous pattern! Oh to have more time to design more. I can't hardly wait for summer so I can relax a little.